Order our FREE sample pack today to see our full colour CMYK litho print. Our sample pack comes with a £5 voucher which can be used towards your first order of cheap print online. But we now also print same day and next day using digital printers. Our Leeds based digital print hub can turn your print around next day and same day. Just get in touch if you need print - FAST! 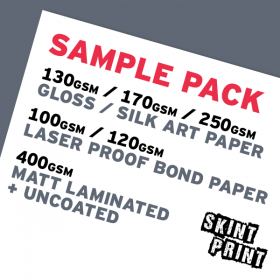 Order your FREE sample pack, containing print samples on all paper and card stocks available from Sk..